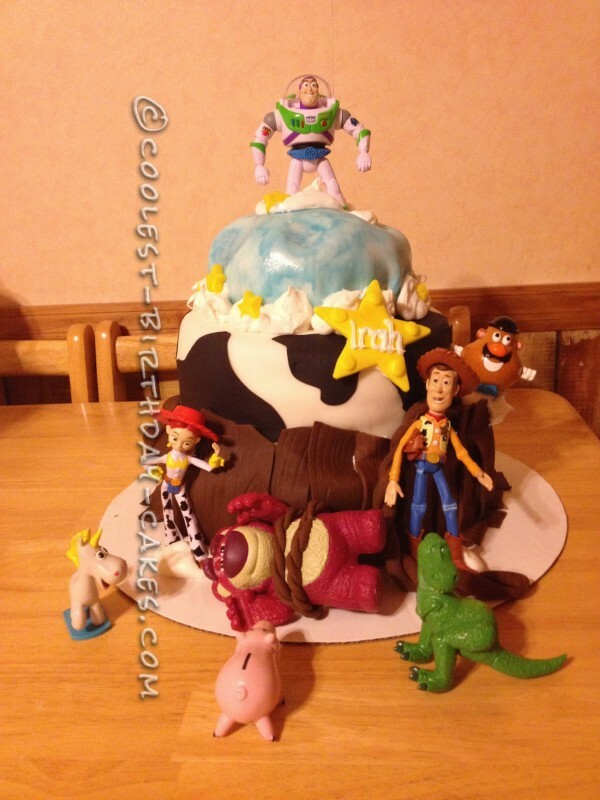 I just finished this Toy Story birthday cake, tonight actually, for my best friend’s 3 year old son, Irah. I have never had any formal training with any of this. Over the last few years I have amassed several gizmos and gadgets that make the decorating much easier, but for the most part I just dig in, work with what I have and hope it works out. I feel that this cake was a huge success. I have two 16″ round cakes on the bottom. Three 14″ round cakes in the middle and a random oven safe metal bowl sized cake on top. I used Wilton chocolate fondant for the ‘fence post’ and rope. I used a pointy tool from my Wilton set, the one you would use for lines on flower leaves and such, to draw the lines and knots on the fence. You can’t see it, but I also ‘carved’ a heart with I+C in it for Irah and Chloe, my 4 year old princess. The rope was just a piece of fondant, rolled out and twisted together. I covered the middle layer in Wilton rolled fondant and cut cow print out of a black Wilton sugar sheet. I flipped the bowl cake round side up and, after crumb coating, used a cupcake corer to cut out some ‘craters’. 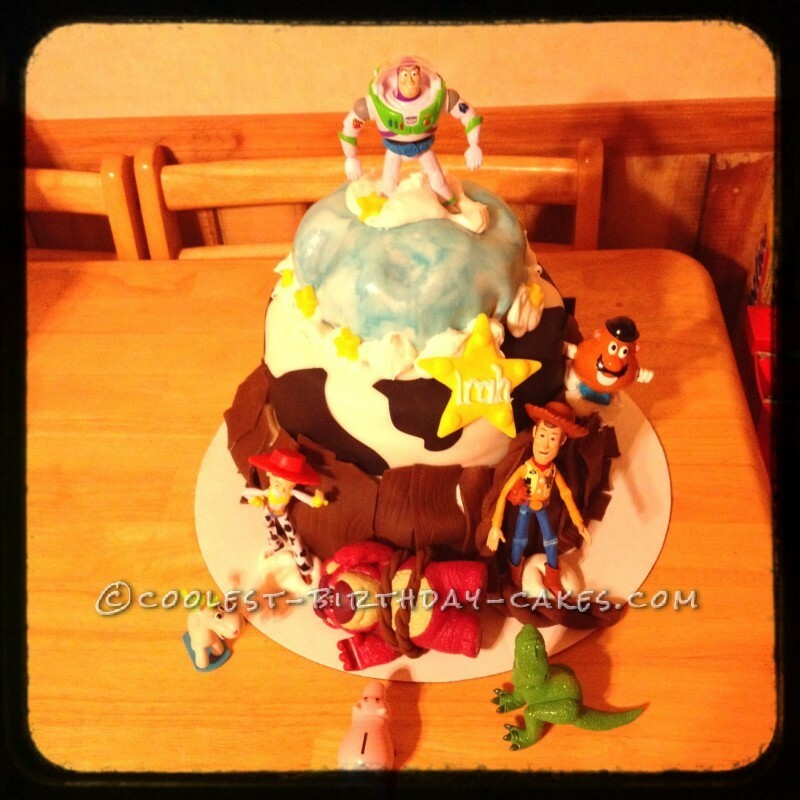 I also covered this layer in Wilton white rolled fondant. I colored it blue by mixing Wilton royal blue gel color and a little water, then used a sponge paint brush to brush the color on. The stars are dusted with yellow shimmer dust for a little extra sparkle. I really had a lot of fun making this, but the best part was the smile on Irah’s face, and all the giggles, when I walked in with his Buzz cake. He was so excited he wanted to eat it before anyone else got to the party! 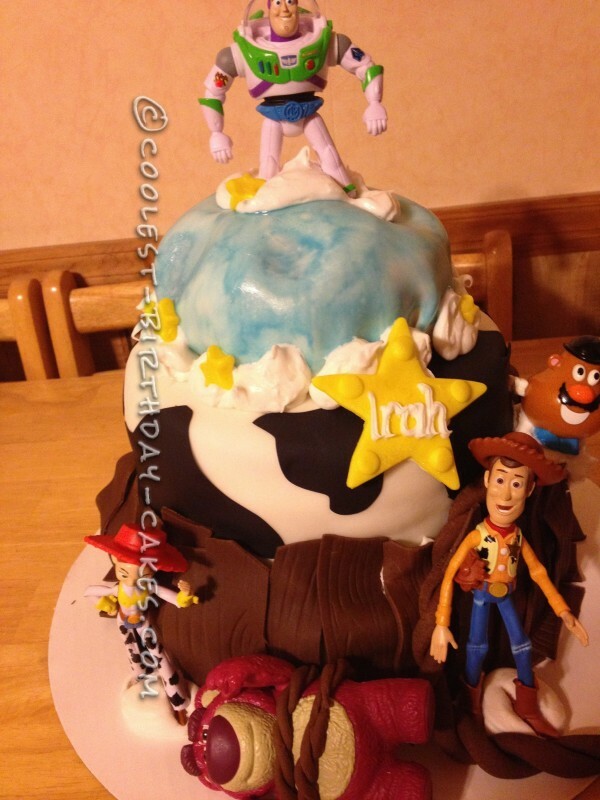 Birthday cake idea posted by Ashley B.